"Peter Stekel has, once again, penned a meticulously researched account that pays homage to America's Hidden Battle, that of the rigors, dangers, and incredible number of lives lost in training. Michael Sledge, author of Soldier Dead: How We Recover, Identify, Bury, & Honor Our Military Fallen. Crew biographies presented here expand upon the text presented in my book, Beneath Haunted Waters. A lot more information is provided about families of the boys in hopes it will be of help to family genealogists and archivists. Many more photos are also provided. All photos, unless otherwise marked, were graciously loaded to me by the boy's families where the copyright and use for permission still reside. 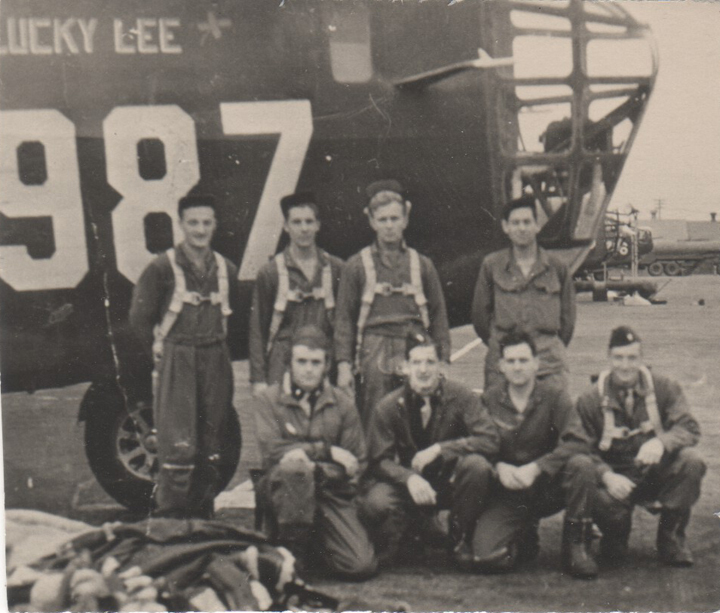 An "*" alongside a photo, below, indicates a crewmember's family I was unsuccessful in locating or speaking with before the book's completion and submission to my publisher. Copyright 2017 Bursey & Cronin families and used with permission. 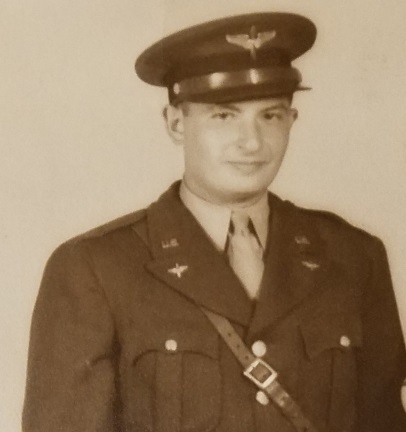 Pilot, 2nd Lt. Charles Willis Turvey, Jr.
Born: July 23, 1921. Hometown: Reesville, OH. Unmarried. Group burial at Arlington National Cemetery, Sec: 15, Site: 24LH. Born: December 13, 1919. Hometown, Los Angeles, CA. Married with a daughter. Group burial at Arlington National Cemetery, Sec: 15, Site: 24LH. Born: October 15, 1919. Hometown: Olean, NY. Unmarried. Group burial at Arlington National Cemetery, Sec: 15, Site: 24LH. Born: June 12, 1916. Hometown: La Crosse, WI. Unmarried with a son. Group burial at Arlington National Cemetery, Sec: 15, Site: 24LH. Born: December 17, 1921. Hometown: Rutland, VT. Unmarried. Buried at St. Josephs Cemetery, Rutland, VT.
Born: November 30, 1923. Hometown: Toledo, OH. Unmarried. Group burial at Arlington National Cemetery, Sec: 15, Site: 24LH. "In Beneath Haunted Waters, author Peter Stekel recovers a compelling story of bravery and unspeakable loss from the icy vastness of California’s Sierra Nevada. This wartime story of youthful bravery and the desperate times that put these men at risk deserves to be read and remembered by us all." William C. Tweed, author of, King Sequoia: The Tree that Inspired a Nation and Uncertain Path: A Search for the Future of National Parks. 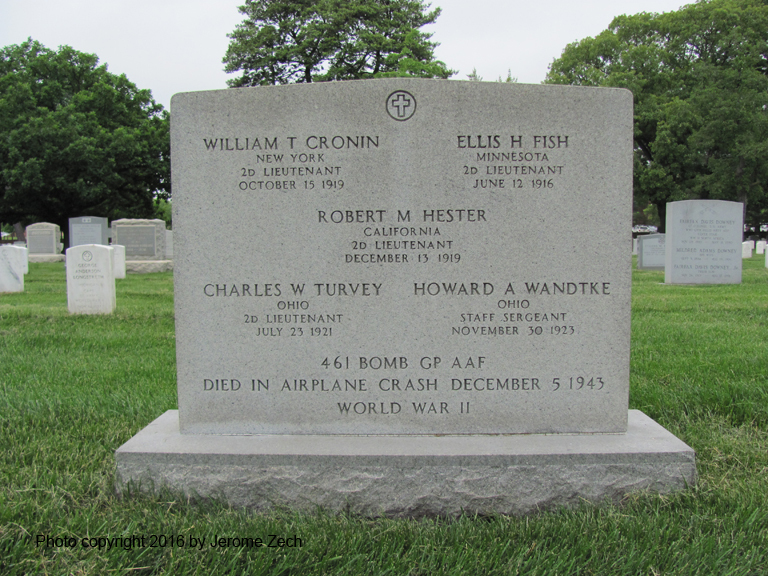 The Crew of Exterminator - The airplane ditched (crash-landed) into Huntington Lake reservoir on December 6, 1943 with the loss of six of eight crewmembers. An "*" alongside a photo, below, indicates a crewmember's family I was unsuccessful in locating or speaking with before the book's completion and submission to my publisher September 6, 2016. Born: July 3, 1917. Hometown: Wilkesboro, NC. Died: April 26, 1957. Married with three children. Forsyth Memorial Park, Winston-Salem, Forsyth County, North Carolina. Born: April 13, 1922. Hometown: Newark, NJ. Died: June 22, 2014. Married with children. Buried Royal Palm Memorial Gardens, West Palm Beach, Florida. Born: July 20, 1920. Hometown: Prestonburg, KY. Unmarried. Buried in the Mayo Family Cemetery, Floyd County, Kentucky. Born: May 29, 1913. Hometown: Wauwatosa, WI. Married with no children. Buried along with Franklin Nyswonger at the Ft. Snelling National Cemetery, 7601 34th Avenue, S. Minneapolis MN 55450.